A package from Ambika. She chose perfect yarn and fabrics for me, I loved everything in the package! 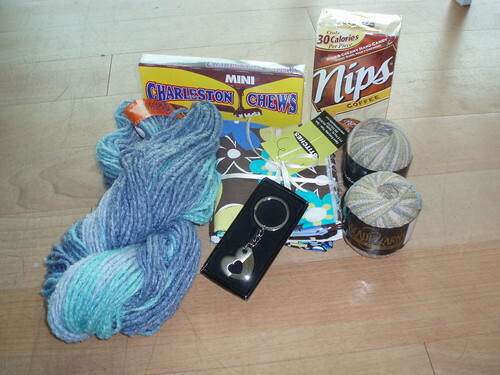 There were beautiful skeins of Cascade Wool, great turquoise fabrics, candy, and a cute heart keychain. Thanks Ambika! 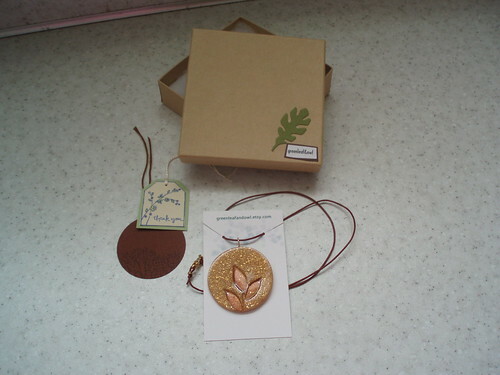 A purchase from Greenleaf & Owl, a beautiful leaf pendant. I will definitely be ordering from Eva again. Check out her Etsy shop. 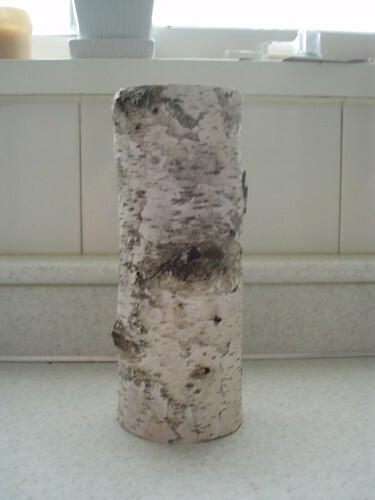 My birch bark tube vase from Small Stump. After checking their website religiously for weeks because this vase was sold out I finally got one. Now I just need some beautiful flowers peeking out of the top. Because I wasn’t perfectly happy (thanks a lot OCD) with my first Amy Butler Clutch from the March In Stitches Sew Along I made another. 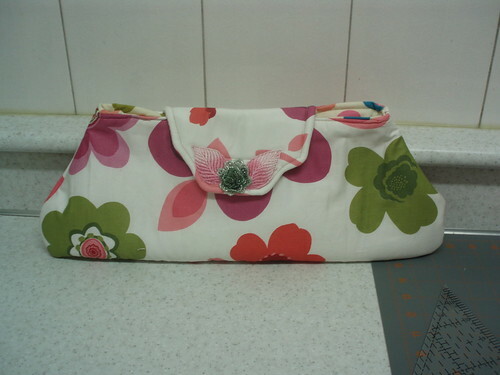 I switched the fabrics from the first one, polka dots on the inside and fun flowers on the outside. I omitted the divider, a purse this size doesn’t need a divider in my opinion but now I can see that AB added it to make the purse more structured and stiff. I thought it was much better until I realized I had sewn the flap closure on backwards so the velcro was on the wrong side of the flap. Instead of ripping seams which I hate with a passion I cleverly covered them up with some cute little embellishments I found at Dongdaemun. 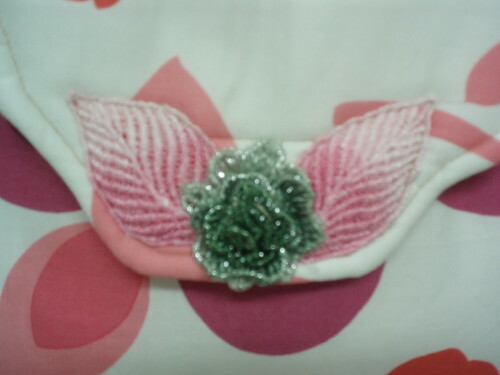 A closeup of the fabric embellishment, hiding the mistake velcro. Now, I have two bags for Hawaii! What a unique vase! Cool! And those bags? Simply perfect for Hawaii. Nice work! I’m glad you liked the yarn. And kudos on another darling clutch! Lots and lots to be happy about!!! !Love your clutch and that fabric in your parcel is to die for! This is a beautiful clutch! Great creative thinking!